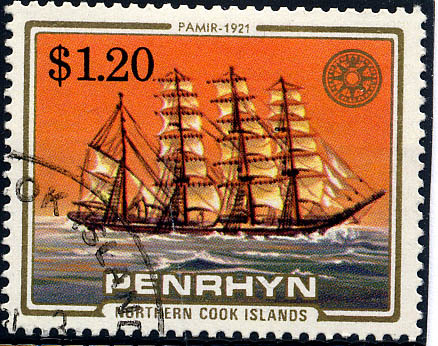 29 July 1905 launched in the afternoon at 3 o’clock under the name PAMIR. Named for the Central Asian mountain range. She was the third of 8 sisterships. Tonnage 3.020 gross, 2.777 net, dim 96.34 x 14.04 x 7.99m. 18 October 1905 delivered to owners. Built for the nitrate trade from Chili. 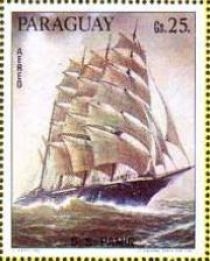 31 October 1905 sailed from Hamburg for her maiden voyage under command of Captain Prützmann, passed 12 November Lizard Point and arrived 70 days later at Valparaiso via Cape Horn. In 1906 she made even a faster passage when she made the passage from Lizard Point to Valparaiso in 64 days. Her return trip from Iquique to the Scilly Islands was made in 75 days. May 1911 command was taken over by Capt. R. Miete until March 1912. 1914 Was she under command of Captain Max Jürgen Heinrich Jürs. After he sailed from Chile in 1914 he heard that war had broken out, he set course for Santa Cruz de la Palma, Canary Islands. She was laid up near Santa Cruz in the bay for the rest of World War I. After the war the vessel was allocated to the Italian Government as war damage compensation on 17 March 1920. She was thereafter laid up at Castlelamare and Genoa She was send to Hamburg in 1921 to discharge her belated cargo of nitrate, then she went round to Rotterdam in tow to load a cargo for Italy, after she was employed in the Mediterranean. She was bought back by Laeisz for £7000 in February 1924. No under command of Captain Hinrich Nissen she was again put in the nitrate trade until July 1931. She came under command of Capt. 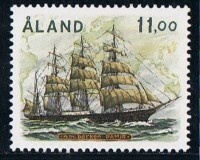 Karl Gerhard Sjögren and she entered the grain trade to Australia, with mostly her outward voyages with timber from Europe. When World War II broke out Finland was in state of war with Great Britain the PAMIR was underway from the Seychelles Islands in the Indian Ocean with a cargo of guano for Wellington, where she arrived in March 1941. She was seized at Wellington, New Zealand on 3 August 1941. Managed by the Union Steamship Company. She was used as cargo carrier and cadet ship, and made during the war a handsome profits for the managers of £30.000. 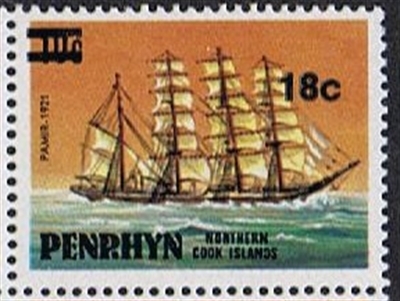 Under the New Zealand flag she made ten voyages mostly between New Zealand and the west coast of America. 02 March 1948 she was visited by Princess Elizabeth (now Queen) and the Duke of Edinburgh in London. 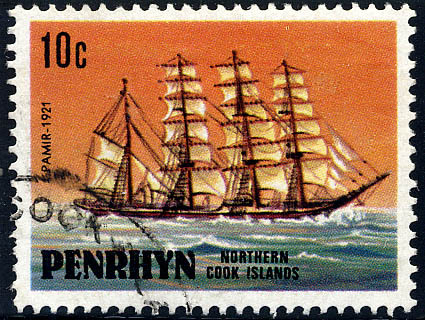 Her latest voyage under New Zealand flag when she was towed from the Thames to Antwerp to top up with slag, arrived 18 August 1948 at Auckland after a passage of 109 days. The last round voyage to England, she did not make any profit but a loss of £ 10.000 and the Union Steamship Company was not more interested in her. Under command of Capt. 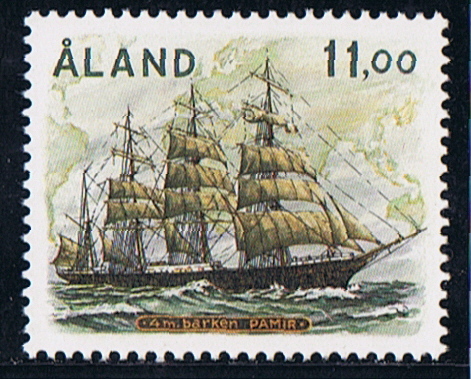 Verner Bjõrkfelt she sailed in ballast from New Zealand. She was the last sailing ship chartered to carry grain from Australia to Europe on 28 May 1949 she sailed from Port Victoria to Falmouth for orders with on board 4233 tons of barley in sacks. She made the passage in 127 days. She sailed three days before her sistership the PASSAT, which arrived 110 days later at Queenstown. 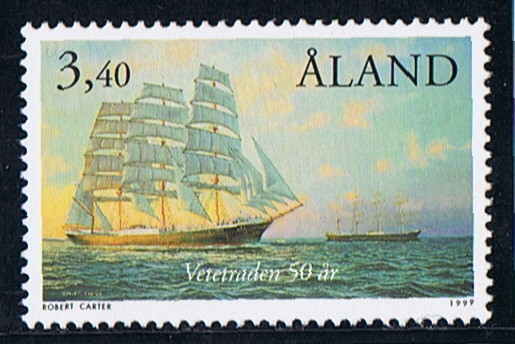 The Aland stamp issued 1999 3m40 shows both vessels together. After arrival the Ministry of Food in the U.K. as storage chartered her for her cargo until it was needed. After some time she discharged at Penarth and was then laid up. 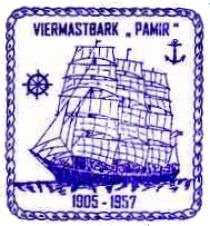 In December 1950 the PAMIR and PASSAT were both sold to van der Loo at Antwerp for scrapping. She were towed to Antwerp. Both were saved from the scrap yard by the German owner Heinz Schliewen of Lübeck. Schliewen would use both vessels as cargo-carrying sail training vessels. She was given an auxiliary diesel motor, which could give her a speed of 7.5 knots. Accommodation for 60 to 80 cadets, and fitted out with watertight bulkheads. She made a round voyage to Brazil, but the ship was very costly to run, and after her return she was laid up at Hamburg. Early 1954 it was announced that she would be sold in a public auction and she came under the hammer on 2 April 1954 and she was bought by the Landesbank Schleswig-Holstein for DEM 310.000, the main creditor of the former owner..
1956 She was sold to the Stiftung Pamir und Passat (a consortium of 40 German shipowners) at Lübeck. 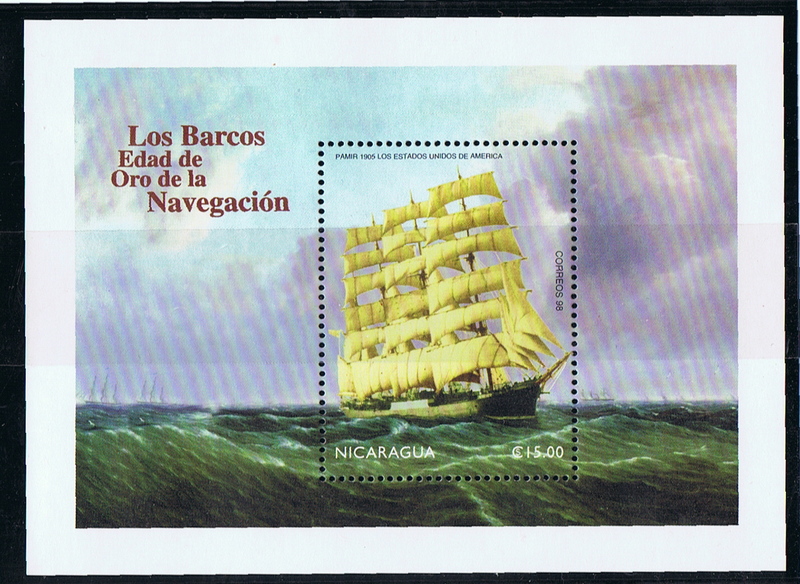 Used again as a cadet-training vessel between Europe and South America. On her fifth voyage under command of Capt. Johannes Diebitsch she sailed on 10 August 1957 from Buenos Aires loaded with barley in bulk and bound for Hamburg on board a crew of 35 and 51 cadets. When in a position about 600 miles West of the Azores she sailed in a hurricane, which blown away most of her sails, so she could not more hove-to. SOS messages calling for immediately assistance were sent, and some ships in her vicinity came to the rescue. 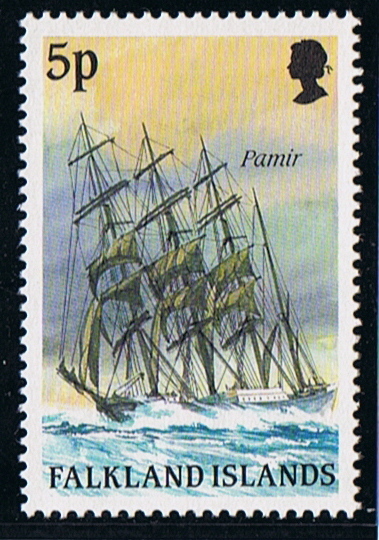 But before she arrived the PAMIR was blown on her side and capsized. She sank in a position approximately of 35 57N and 40W. on 21 September 1957 at 11.15. Of her complement of 86 men only 6 men were rescued, five were picked up from a waterlogged lifeboat by the US steamship SAXON and the sixth was rescued by the US Coast Guard cutter ABSECON. Falkland Islands 1989 5p 571. 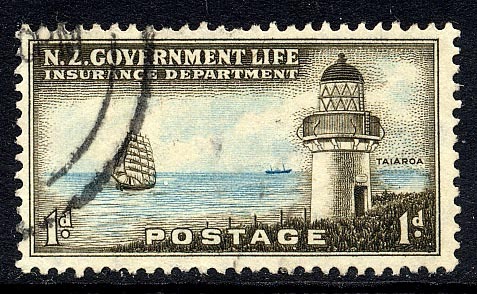 New Zealand 1947 1d sg L43, 1967 1c sg L50. 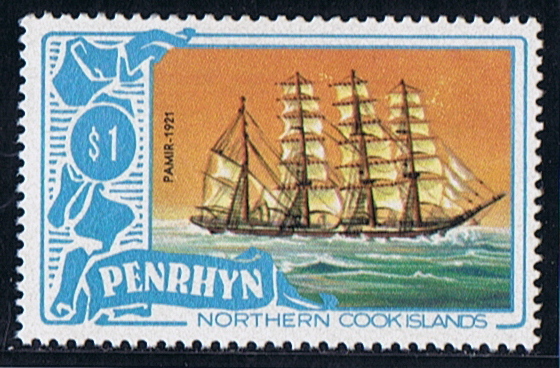 Penrhyn Island 1981 10c sg 183 and $1 sg 203, 1983 18c sg 300, 1984 $1.20 sg 352, 1985 $1.20 sg o32. Sail Training and Cadet Ships by Harold A. Underhill. Ships of the World by Lincoln P. Paine. Dictionary of Disasters at Sea during the age of steam 1824-1962 by Charles Hocking. Some web-sites. 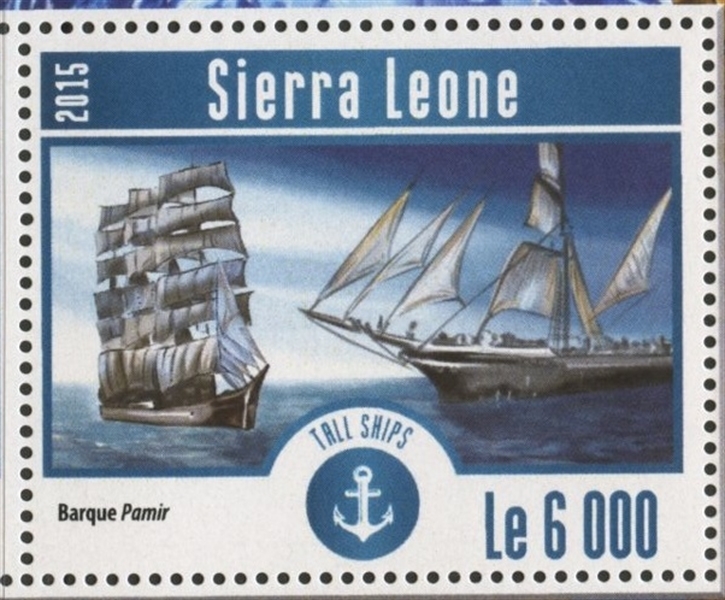 One more stamp of the PAMIR.